*Please do not forget to mention the item number of the piece or pieces you're interested in. What is a shadowbox setting? 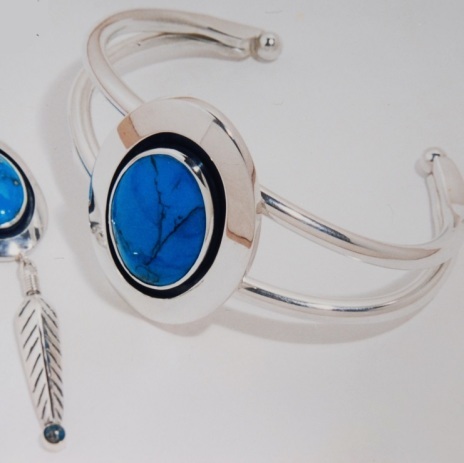 The turquoise stones in the pendant as well as the bracelet are mounted in settings called shadowbox; this dramatic style - originally a Dineh (Navajo) silversmithing way of stonesetting - is characterized by deep, darkened recesses set with “floating” stones in high bezels. In the case of this jewelry set, a high bezel for holding the turquoise cabochon is soldered inside a large oval shadowbox frame that I - with the aid of a jeweler's saw - cut out of the slightly domed pendant and bracelet head. I made the bezel of a slightly smaller size than the shadow box it has to fit into. This consequently leaves a rather narrow “trough” around the bezel. Then the “trough” becomes oxidized in order to highlight the raised bezel, and the shadowbox design is completed. The way I see it, this set, which I carefully handwrought of sterling silver, has a design that is both quintessentially Native American and absolutely modern and provides testimony to the pride I take in my ancestry. Above all, the story behind the bracelet and pendant celebrates the beauty and wisdom of the world of my Ojibwe Anishinaabe ancestors, which will always be my main artistic inspiration and design source. This set of matching bracelet and pendant, titled "In The Bosom of the Earth," belongs to a shadowbox jewelry series named Birth And Regeneration. 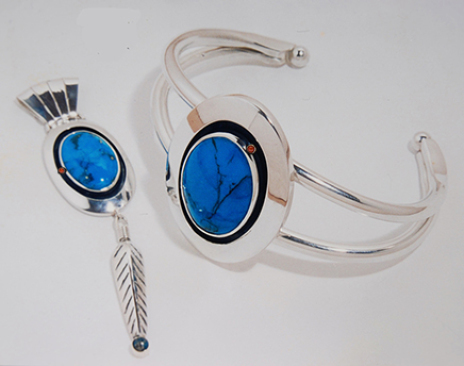 The highly polished design and the theme of the unique set – note how the turquoise stones are mounted in shadowbox settings; this style is characterized by deep, darkened recesses set with “floating” stones in high bezels - do not just bear witness of the partially Native American background of jeweler Zhaawano; they're particularly inspired by the ancient teachings of the Midewiwin, the Society of Medicine and Ethics of his own ancestors, the Anishinaabe Peoples. > Visit Zhaawano's art blog to read about the symbolical meaning of the jewelry set.